(Washington, D.C., January 19, 2016). Today, Larry Klayman, counsel for individual plaintiffs who were seriously harmed by the dangerous drug Levaquin, brought suit in the U.S. District Court for the District of Columbia alleging violations of the Racketeering and Corrupt Organizations Act ("RICO"), the Lanham Act, and a variety of common law torts. At the heart of this scandal is former FDA Commissioner, Dr. Margaret Hamburg, appointed by the Obama administration, and her husband Peter Brown, co-CEO of Renaissance Technologies, L.L.C., a major hedge fund in New York. While Dr. Hamburg was head of the FDA, her husband profited enormously from as much as half a billion dollars in Johnson & Johnson stock, the maker of Levaquin, held by Renaissance Technologies. 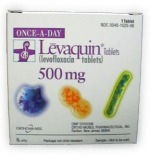 Levaquin is a drug intended to treat a range of infections, including routine sinus, skin and urinary tract infections. The complaint alleges Dr. Hamburg and her husband, as well as others at Renaissance Technologies, L.L.C., conspired with Johnson and Johnson and other defendants to suppress information about the harmful effects of Levaquin. To reveal it would not only harm Johnson and Johnson's profits, but also invite significant lawsuits and drive the price of Johnson and Johnson stock downward, thereby financially harming Dr. Hamburg, her husband and Renaissance Technologies' profits. Plaintiffs were the unwitting victims, suffering from a variety of medical conditions, some of which were just recently disclosed at an FDA Advisory Committee Hearing on November 5, 2015. The complaint can be found at www.larryklayman.com and its allegations speak for themselves. "This is a major scandal, one that seriously affects the health of not just plaintiffs, but thousands of others. Defendants are alleged to have callously reaped large financial gains and profits at the expense of my clients. The entire sad episode is an example of how some in private industry are alleged to conspire and act with Washington D.C. public officials to greedily line their own pockets, leaving everyone else to be damned." The complaint asks for millions of dollars in damages, but justice is the main goal. Larry Klayman is the founder of Judicial Watch and Freedom Watch, and a former federal prosecutor who, during his tenure at the U.S. Department of Justice, not coincidentally prosecuted on behalf of the Food and Drug Administration and other federal agencies, as well as serving on the trial team that, in a landmark antitrust case, broke up the monopoly of AT&T.